With technology disrupting so many different aspects of the trucking sector, it is no surprise that the aftermarket segment would not be spared. Whether we are talking about electric vehicles, connectivity, telematics, autonomous systems, e-commerce, and so much more – these are all factors that will impact the transportation sector in the future. One of the technological factors that will present the first, and most immediate challenge to the trucking sector will be advanced driver-assisted systems (ADAS). In the current market, ADAS is currently included in around half of all production Class 8 commercial motor vehicles. With that adoption rate only expected to grow, OEMs will need to ensure their workers are properly trained on maintaining and servicing these systems. Now many are wondering what is next for ADAS adoption. Many industry insiders believe the next level will be electronic steering. 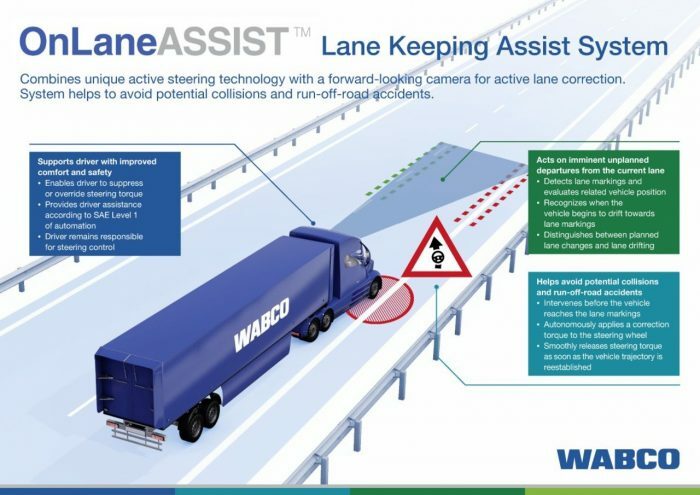 Consider that nearly a third of all accidents involving large big rigs are a result of unsafe lane changes and it isn’t hard to see how increased adoption of steer-assist systems will become more widespread. The trucking industry has moved from warning the truck driver about an issue to providing ways to actively assist them. While ADAS will make a big impact on the aftermarket, service and maintenance of braking and steering systems will continue to be the core foundation of aftermarket focus. Combining the needs for vehicle ADAS retrofits alongside routine maintenance needs will create a far better pipeline for fleets. And although ADAS systems add complexity to vehicle maintenance needs, the systems in use today are largely standardized, which takes the headache from fleet technicians who are trying to adapt to managing new technologies. Vehicle electrification will be the next brave new aftermarket world. While diesel engines still have the highest level of penetration, alternative-fueled vehicles are making a big push into the market. Fortunately, the OEM market will likely consist of a mix of differently-powered vehicles, as opposed to be existing in an either/or paradigm. One thing to consider is that over half of all transit buses in the United States are already electric-powered. Yet, further adoption will need some help from the aftermarket. One of the big barriers to full-on electric adoption is still the infrastructure problem. For truck drivers on irregular or long-haul routes, will there be enough charging infrastructure to prevent downtime. Furthermore, even with charging stations in the right places, how long can a trucking company afford to have the truck down charging. These are critical questions that fleets will be asking. Can they get the same amount of work done regardless of the powertrain? The last thing a motor carrier wants to do is end up with all sorts of conflicting processes in the shop. While the industry is on the lookout for diesel technicians, how will their skills translate for different powertrains? Another key area where the aftermarket finds itself in a major change of phase is in the area of connectivity. Sensors and computational systems allow fleets to equip themselves with predictive analytics. It is now possible to understand the correlation between a truck’s behavior and a particular outcome. The use of connectivity and telematics provides fleets with a wealth of data that sometimes can be transmitted back to the OEM for future design improvements. Still, these issues raise the question of who owns the data. While much of the data can be sent back to OEMs in many cases, data can be both public, private, or proprietary. The hope is that companies do a better job at sharing data, as this is better for the industry as a whole. For the most part, fleets are generally under the impression that the data they generate is owned by them. As a result, suppliers would benefit from fleet-level partnerships that allow them to access the data fleets are producing. The advanced technological means by with trucking companies now get the job done are not relegated solely to the digital realm. Some of the more old-fashioned aspects of the trucking aftermarket sector are also facing pressures. Take downsized engines as one example. While downsized engines are increasingly popular to provide better fuel economy and lighter weight, they have a direct impact on other downstream components. Take transmission OEMs as one example. Engine and transmission companies must partner up to prevent downstream problems from major component redesigns. Of course, as all these changes make their way through the trucking space, this will have a major impact on the aftermarket and on how fleets prepare for vehicle maintenance and repair. As hardware and software systems become more complex, training will have to evolve. The general service network will have to widen to accommodate the new technologies. As engine and drivetrain technologies evolve, the vehicle control architecture underpinning them needs to also change. Technicians are used to common diesel technologies, so how will they adapt, especially when they are searching for aftermarket components to complete their repairs? All these factors are changing the way Class 6 – 8 tractors are being built and maintained, but they are also changing the overall nature of the freight network. Trucking companies, suppliers, shippers, and OEMs are facing a shift in forces that is upending the traditional business models that have been in use for nearly a century. While advancements in telematics and hardware changes are disrupting the aftermarket segment, other challenges appear in the form of established players. Consider that e-commerce giants like Amazon are looking to sell fleet parts online in competition with traditional distributors and dealers, and it isn’t hard to see why the aftermarket world could be in for a big shakeup. Many parts companies are now struggling with what they are calling the “Amazon effect.” Amazon is now selling their product but is not buying it directly from them. As a result, parts companies and aftermarket partners are trying to figure out where Amazon is getting the parts, as the business model that runs through Amazon creates challenges where returns are concerned. As fleets adopt new vehicle technologies, shops will wind up using a far lower number of parts. As traditional diesel powertrains evolve and driver assistance systems reduce collisions, the number of aftermarket parts required by fleets will drop precipitously. Take electric vehicles as one example. Electric tractors will shift from the standard 12-volt system to as high as 800 volts. Even more, current diesel-powered commercial motor vehicles utilize as many as 30,000 parts in their operation. Electric vehicles by comparison utilize around 7,000 parts, which represents a huge drop. Will this new paradigm put big operators out of business? Likely not. Consider that emerging electric truck OEMs like Tesla, Nikola, and Thor will have a need for aftermarkets of their own to keep their trucks operational. The real question is whether they will partner with OEMs or try to create their own aftermarket channels. With Tesla eschewing the standard dealer model for selling their cars, it could very well be that they go after their own aftermarket for electric truck components. Obviously, there must be a service network in place for these vehicles. These companies will have to figure out how they can meet the service needs of their customers. The same can be said for the growth in the natural gas market. Yet, the internal combustion engine is not going anywhere any time soon. Related parts companies will still be needed even as the market continues to shift away from diesel power and towards more renewable and sustainable fuel sources. Yet, while the aftermarket sector faces growing disruption on one front, there could be opportunity on another front. As the push towards autonomous and semi-autonomous vehicles continues, the aftermarket will be as much in needs as ever before. From road sensors to truck sensors to all sorts of underlying systems that make autonomous use possible, only the aftermarket will be able to fill this need. Fortunately, none of these developments spell the end of the aftermarket. As companies evolve to accommodate the current market environment, they will make shifts to adapt. Aftermarket suppliers will learn and adapt, perhaps even coopting e-commerce sites that deal in aftermarket parts. Even new shopping methods will come into play, such as “omnichannel” shopping, which represents customers ordering their parts online and then picking them up in a physical store. Will the aftermarket adopt such methodologies? In the push to counteract or coopt the e-commerce model, the answer is likely yes. In the end, aftermarket providers need not fear change and disruption. By learning how to embrace it and work with a changing environment, they can ensure flexibility and continued success far into the future, no matter what that future looks like for the transportation sector. Through work with established players and better partnerships with suppliers and OEMs, the aftermarket sector can remain strong for a long time to come.